My daughter loves to wear our retro ski outfits – “vintage” to her. My son looks forward to having BBQ cheeseburger in paradise, on the baselodge deck with music playing. Carboard Box Races and Dummy Downhills are classic ski season ending traditions to test your family’s creativity. The whole gang can get involved inventing a snow sliding corrugated contraption. Dad can be design team engineer, Mom is best as creative material supplier, while the kids can go crazy with costume detail and crash testing. Look for cardboard box races and Downhill Dummy races at Big Sky, Steamboat, Okemo, Loon, Mt Abram and Sunapee. 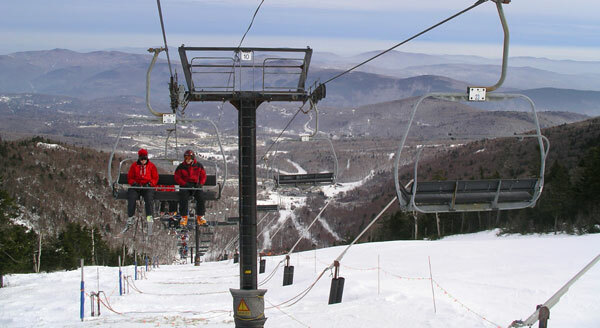 Many resorts incorporate a theme, like Sunapee’s Intragalactic race. Resorts typically give prizes for funniest and most festive, not just fastest sled. 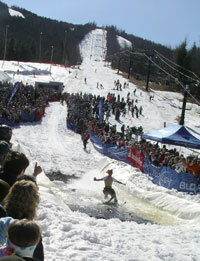 Pond Skimming is a wet and wild spring ski ritual. I recommend this rowdy activity as a spectator sport event only. Suffice it to say my daughter’s ski boots took two weeks to dry after oneyear’s Sunday River splash down. You and the kids can watch pond skimming at Wachusett,Okemo, Killington, Cannon, Loon, Wildcat, Waterville Valley, Sunapee, Sunday River and Saddleback to name a few. Vail hosts the World Championship Pond Skimming in April and its EPIC and coincides with their Spring Back to Vail free music series! Easter is often a warm sunny weekend, and there is no better place to rejoice than in the mountains. 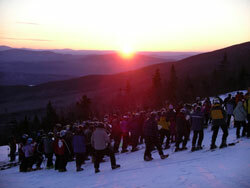 Killington, Stowe, Smugglers, Waterville Valley, Loon and Sugarloaf deliver early birds up the mountain before dawn for a non-denominational Easter Sunrise Service. As a parent of two sleepy teenagers, however, I do not recommend waking their age group for this first tracks family activity. Sunrise Service is better appreciated by the bright and early skiers, with a promise of first tracks, a big breakfast and a treats from the bunny after their morning on the mountain. 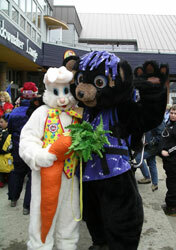 Ski resorts Aspen, Beaver Creek, Killington, Okemo, Jay Peak, Loon, Saddleback, Sunday River and Sugarloaf all host egg hunts; many also have costume parades on the slopes. Some of the best deals on lodging and lift tickets are popping up like crocus in your background this time of year too. Crowds dwindle as the snow turns to sweet creamed corn. Areas with high elevation can stay open well into April. Lather the kids with sunscreen, dress them in layers, and teach them the joys of spring skiing – see our Spring Ski Tips. Forget frostbite and face masks, wacky sunglasses and kooky costumes are the wardrobe of choice. Summer sports will wait.